This e-book is streamlined just for you from the print version with only the stretch and massage exercises included. This easy–to-follow guide designed by a physical therapist and Pilates instructor, will teach you how to use the foam roller to stretch and massage your muscles. Once you try this method of stretching and deep tissue massage, you will be amazed at how great your body feels. The ABC’s of fine tuning your posture. How using the foam roller regularly works to improve your posture. Learn warm-up exercises to relax your body. How to use the roller for deep muscle stretching. Massage techniques to rid your body of muscle tension from head to toe. This spiral- bound FULL color home exercise program will allow you to re-recreate the Pilates mat class with modifications and props in your own home. This book is published by OPTP (Orthopedic Physical Therapy Products) a leader in the field of providing fitness and therapy products throughout the world, and written by a physical therapist/Pilates instructor who has been perfecting and modifying the mat program with props for the 50 plus crowd for years. NOW you can do Pilates no matter what your age! Age Perfected Pilates is designed especially for the mature fitness enthusiast. If you have back pain, neck pain, arthritis, or other aches and pains from an active lifestyle, this program will suit you. Now there are no excuses for skipping your exercise routine. Using fitness tools like the soft ball, Body Bolster and weighted balls, this Pilates mat program will help provide the extra support you need for your body as if you had your very own trainer right by your side. The tools allow you to make your workout challenging and efficient, improving posture, strength and flexibility all in one shot. Learn the “Invigorating Body Bolster Chair Workout” that can be done in a chair, in a car or on a plane, allowing you the freedom to workout anywhere at anytime. Better standing and sitting posture. Reduced pain from chronic and other health problems. Increased range of motion and freedom of movement of your joints. Decreased stress and mental tension. 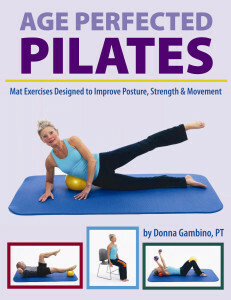 Donna Gambino is a licensed physical therapist of 20-plus years and certified Pilates Instructor. Donna specializes in orthopedic and sports medicine physical therapy and is the owner of Infinity Health, LLC, providing Pilates classes, personal training and professional workshops. 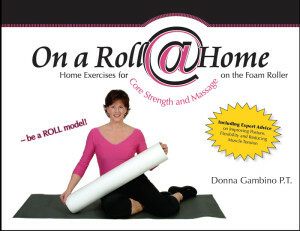 Donna is also the author of the popular fitness book, “On a Roll @ Home, Home Exercises for Core Strength and Massage on the Foam Roller. The exercises in this new book have proven successful and fun in her classes with the 50+ population. So grab your fitness tools and a mat and have a great Pilates workout. How do I exercise on a foam roller?…Yikes! Over 50 exercises for all fitness levels—that includes you. Finally—a book that explains the mysterious uses of the foam roller for the average exercise enthusiast. Here it is: an in-your-face physical therapist and Pilates instructor with a passion for posture offers you a challenging and creative workout on the foam roller. You’ll have fun and the results will be rewarding. Once you try this method of strengthening, stretching and deep muscle massage, you will be amazed at how great you feel and look. With this combination of fitness moves and Pilates-based exercises you’ll be getting a multi-faceted workout. So, get on the roller and roll yourself into shape ! How the foam roller works to improve your core strength. What your core muscles are and how they work. How to achieve good posture. How breathing can help improve your workout. The ABC’s of fine tuning your posture and moving more efficiently. How to improve balance and flexibility. How the roller can help decrease neck and back pain. Massage techniques to rid you of muscle tension after a long day at your desk! ORDER “On a Roll @ Home” Now!. To ship out of the US please contact Infinity health directly for your order. You may also order this book by contacting Infinity Health, LLC via phone or email. Please provide us with the following information: Name, billing/shipping address, number of copies. *Contact us for bulk orders at infinityhealth@comcast.net. Click the pics to take you to my Amazon Associate Links. Below are items that I have been referring clients to on a regular basis. These items are ones that I recommend and use in my private practice training. Check back now and then for new items added to the list if we talk about them in class. This shop is designed to make it easier for you to find the products you need to make your fitness and lifestyle routines more comfortable. Foam Rollers- I get all my rollers for OPTP. The Black Axis one is the one we use in class. It is durable and will last forever. Check with me before you order, I may have some in stock. Pro-Roller- This is a softer version of the one above. If you find the black roller too dense, you may like this softer gentler version more comfortable. Pro-Roller Arch- If you have rounded upper back posture and you find it difficult to lay on the roller this will solve your problem. Place this under your head to align yourself. You can also use this tool to position yourself comfortably laying on your side for Pilates moves or side sleeping. Posture Bricks– I designed this posture brick with OPTP to allow you to adjust positioning on the mat, reformer and stability chair. There are 3 sizes. We use the two longer ( 18″) versions in class. If you have a knee problem and cannot kneel these can help you to weight bear on your shins instead of your knees. They are also helpful for head positioning on the mat and for long sitting for those of you with short hamstrings. Pick either the 2 or 3 inch height. Soft Gym over Ball- This is the 9 in ball we use in class. Helpful for increasing exercise difficulty and for stretching. Check with me before ordering, I may have them in stock. The Franklin Balls- These soft balls are used to help release muscles and alleviate tension throughout the body. I can help you with the proper exercises. Weighted Balls- We use these balls in class to increase the intensity of your Pilates exercises. They come in varying weights. You will need 2 balls. I recommend 2 or 3 # size. The Magic Circle – This resistive training tool is used in Pilates to make exercises more challenging. It is lovingly referred to as the “ring of fire”. Great small piece of equipment to use at home. The Gaiam Muscle Massager– This is a great tool to help work out your kinks and loosen tight muscles. Can be used on the entire body and is great for travel. 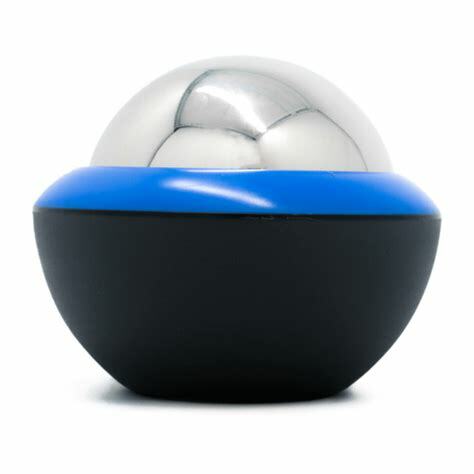 Large Stability Exercise Ball– You will need one of these if you will be doing the Pilates ball class. Be sure to check the height/size guide. Most of you will do well with the 65 cm ball if you are average height. If you are petite the 55 cm ball will work. Hand held pump- For those of you who need your balls inflated at home or at class. Here is a portable pump with the needle attachments too that work for small balls. Balance Disc– This pancake shaped inflatable pad simulates sitting on a ball. If you have a desk job this can help you to keep correct posture during the day and alleviate back pain by continually causing you to move. You can use it for exercising the back and pelvis and it is a great tool for re-training balance in the ankle or knee after injury. Airex balance Pad- This tool is great for chondromalacia patella and total knee replacement patients who need to kneel on something firm but soft. Great for exercise or home use. Can be used to retrain balance after injuries, and can be used for sitting if needed. Airex products are costly but are durable and used in clinics. Airex Pilates Mat- this is an investment item. It is the best exercise mat that you will ever buy and will last forever. These are used across the world in Pilates studios. If you are a diehard exerciser, you will not regret it . You’ll never have to buy another. Arthritis Gloves– If you have arthritis pain in your hands, wrists, or carpal tunnel these can really help with pain control. They are great if you have had a day of gardening and you have discomfort, or if you are a crafter and want to protect your hands while working. Note: look for the correct size by measuring. 8 foot long yoga strap– If you like the stretching we do in class or the postural strapping techniques on my YouTube channel you will need this length strap. Straps with the D ring closures are idea. Yoga Toes- if you have problems with foot pain, bunions, plantar fasciitis or Morton’s neuroma, these may help relieve your pain. Wear for a few hours a day will elevating your feet to help relax intrinsic foot muscles, and create joint space. Balance Pods- if you have problems with plantar fasciitis and heel spurs these standing pods can really help. The spikey surface can help increase circulation, and loosen tight connective tissue in the plantar fascia. Use daily and see results ! Mckenzie Cervical Pillow- If you have neck pain from bulging disc, arthritis or injury this long pillow can help. Slip into your pillowcase and it will allow you to keep your proper neck posture whether you lay on your back or side. Note: it is stiff when you first get it. play around with it for a while to loosen it up. Two Old Goats Pain Balm- If you have any pain due to arthritis, tendinitis, or muscle bruising, this is a miracle balm. Rub into area twice a day for a few days and you can get great relief. This has been a student favorite for pain control. All natural ingredients and a fun name. Note: the balm is preferred to the lotion. Dr Teals Epsom Salts- If you need pain relief, magnesium is the key. You need 2 cups of these Epsom Salts in your bath and you soak for 20-30 mins minimum. Any scent will be fine. They are helpful especially post- massage, post- workout and post- yardwork ! Zyflamend- This is a wonderful herbal supplement to help control inflammation throughout your body. I have had great results with it. Please check with your physician before starting any herbal supplements to make sure there are no contraindications with drugs you may already be taking. WRIST GLOVES– If you have sensitive wrists and weight bearing on your hands during plank or reformer activities is uncomfortable these gloves will really help solve the problem. By repositioning your wrist joint you can decrease pressure put on the bones and make your workouts much more enjoyable. You don’t want to miss out on planks ! Mckenzie Lumbar Roll for Desks and Cars- If you don’t have adjustable lumbar support in your car this may be the answer for you for long car trips. You can also use this at your desk with the strap that is attached. Gliding Discs– If you like the workout we do in class why not get a set for home. Make sure you decide if you need the discs for hard surfaces or carpets before ordering. Theraband ( beginner set)– If you like the band workouts here is a set of bands of varying resistance levels that you can use for a great home or travel Pilates workout! Theraband- The one we use in class on the mat and with the Bow. It’s a heavier resistance band for a challenging workout . Lo-Back Trax– A way to get mild lumbar traction at home. Can also help with SI dysfunction. Comes with instructions and there are YouTube videos as well . Also see me for instruction once you get it. 3 # Weighted Hula Hoop– This hoop is the same one we use in class. Snaps together and easy to use. It’s not your kids hula hoop.